SG's Baked Ziti. Made With Love. This is a recipe made with love. Well, it's a recipe that I came up with simply because I love all of the things in it individually. And, while that doesn't always work (think hot fudge meets a NY strip meets blueberry preserves), combining favorites often creates a twist on a dish that is simply delightful. I made this mental list, and out of that, SG's Baked Ziti was born. My hubby went so bonkers over this one that it will now become a regular at our house. And, I will now be able to go shopping whenever I want - all I have to do is make him a pan of this the day before. *Yes, our marriage is home to a delightful little rewards system. And, that is all I'm gonna say about that. My in-laws read this. 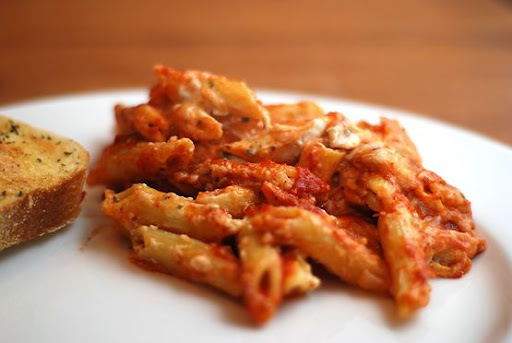 This baked ziti is creamy, rich, and full of flavor. The simple tomato sauce is a perfect complement to all of the other flavors - whereas a more traditional sauce full of veggies and spices would have overpowered the love that's supposed to be the star in this dish. And, bacon. Oh, how I love bacon. And, feta. Oh, how I love feta. Love. Made with a whole lotta love. In posting this recipe, I hope it inspires you to think of simple things you love to eat most, and how to combine them into a recipe all your own - to think outside the proverbial box. I often feel bound by long-standing cooking traditions, and I am learning that changing things up often makes for some of my favorite dishes. Here's a little love. From my house. To yours. Preheat oven to 400 degrees. Line a large cookie sheet or jelly roll pan with foil and place bacon, in strips across pan. Bake at 400 degrees for 15 minutes, or until bacon is crispy. (YES, bacon will get just as crispy in the oven as it does in a frying pan. Just don't take it out until it's crispy. Try it. You'll believe.) Drain on paper towels. When cooled, chop into small pieces. Set aside. Cook pasta until al dente. Drain. Return to pot and add sour cream, chopped bacon, feta, and 1/4 cup Parmesan cheese. Set aside. In a medium saucepan, add crushed tomatoes, diced tomatoes, sugar, salt, thyme, and crushed red pepper flakes. Simmer for 10 minutes allowing flavors to combine and until heated through. Set aside. To assemble, butter (or spray with cooking spray) a 9" x 13" baking dish. Spoon 1 cup of tomato sauce into the bottom of the dish. Spoon 1/2 of pasta/cheese mixture over sauce. Top with 1/2 of remaining tomato sauce. Sprinkle with 1 cup of mozzarella and 1/4 cup Parmesan cheese. Top with remainder of pasta/cheese mixtures, remainder of tomato sauce, and sprinkle top with remaining mozzarella and Parmesan cheeses. Cover lightly with foil, and bake at 350 degrees for 45 minutes. Remove foil and broil for 5 minutes, or until top is golden. I am slowly learning that I don't need to follow recipes so strictly. To think outside the box.... but having said that I am SO going to follow this recipe! It looks to DIE for! It doesn't use the food processor, so I'm game! LOL!! I love feta too! The tomato basil feta on eggs is so yummy!! I'm seriously wondering with all this good food that you fit through your front door?! Do you partake in heavy moderation & only take a spoon full or is this something you only do once a week? Once a month? Do.. fill me in on how to stay gorgeous, eat good food & be happy! I would have never thought of changing the ricotta to sour cream. I have tried cottage cheese and that is really good too. But to try sour cream...hmmm...just may have to try this! And the feta! Anything with feta is delicious! Thanks, Sarah! 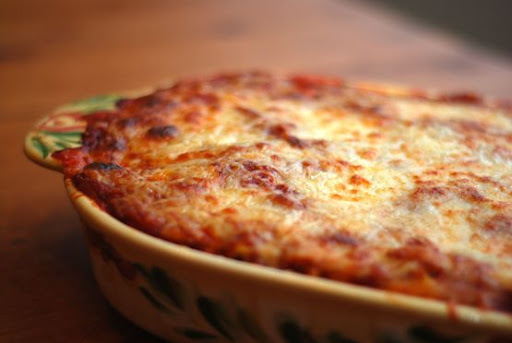 baked ziti is not my fav... so I am so excited to try this dressed up and fancy baked ziti... a little more punch for mom and dad but yet I can serve it to the kids and say, "it's pasta, like pizza only with no crust" and they will be happy. Yummy, yum, yum! Zak loves Baked Ziti. I have a good recipe from Ashley, but this one has meat in it so I think he will like it better. That looks like all kinds of yumminess combined. You're killing me, Sar. That looks heavenly. Seriously. The key is most definitely moderation. I've found that a little of a really good dish is much more satisfying than a whole plateful of food I don't really enjoy eating. The key to happiness - that's Jesus! My hubby would love this - the bacon is such a different addition. I'll be trying this one. I am TOTALLY putting this on our food menu next time I go to the grocery store. We've struggled with pasta dishes lately with Lily's whole egg thing. So glad you posted this recipe!!! !